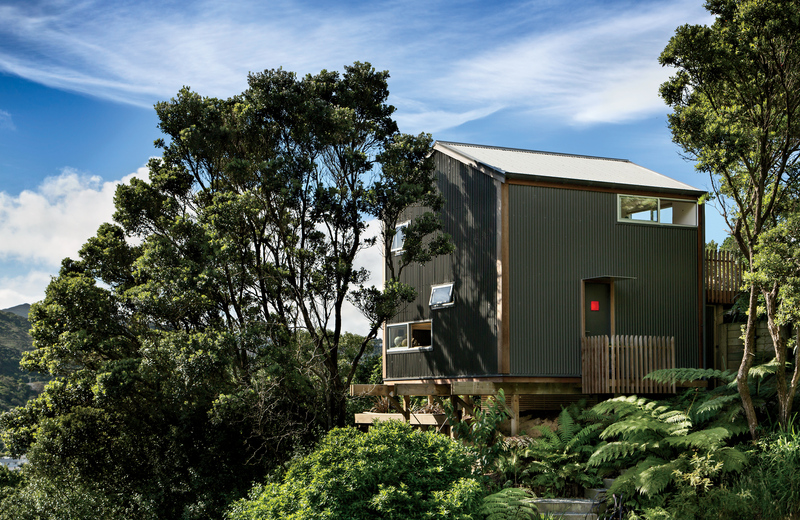 Inspired by the small scale of Japanese residences—in particular, Makoto Masuzawa’s 1952 Minimum House—architect Andrew Simpson designed his own economical 538-square-foot home, set into a wooded site in Island Bay, a coastal suburb outside Wellington, New Zealand. Open enclosures and connections to adjacent living spaces keep the home inviting and airy rather than densely packed—a key feature for an owner of two dogs: Ben, a whippet, and Flynn, an Irish gypsy dog. Simpson runs his practice, WireDog Architecture, from his home study, where custom bookshelves line the perimeter of the mezzanine for a storage solution that doubles as railing. On the ground floor, Simpson’s fiancée, Krysty Peebles, makes coffee in a compact kitchen outfitted with a Foraze Panni sink, Bosch induction cooktop, and Mitsubishi refrigerator. “I suppose you could consider me part of a subculture who lived in various inner-city spaces,” says Simpson, whose previous homes include ad hoc spaces in industrial warehouses, floors of office buildings, and units above shops and bars. 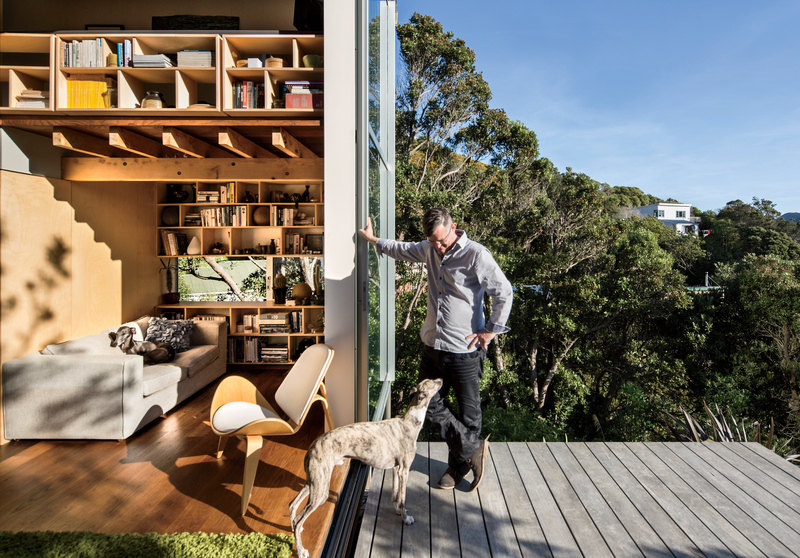 In designing his Island Bay home completely from scratch, he retained his experimental spirit: “We wanted a house that responded to our wider social, environmental, and economic concerns rather than something that blindly followed convention,” he says. Unassuming in sight, the home’s corrugated-metal cladding (above) recalls the tin shed, a vernacular housing type in the region. For Andrew Simpson, the so-called New Zealand Dream—a classic colonial villa on a tidy suburban quarter-acre lot—never held much appeal. When he was a student and a habitué of Wellington’s nightlife scene, Simpson lived in a variety of eccentric spaces, including an active warehouse in which he contrived a home by bending walls of corrugated cardboard into complex, self-supporting shapes. When the couple finally decided to design and build their first real home, it was to these unorthodox spaces that they turned for inspiration. They purchased an untraditional plot—a small and sharply sloping piece of land with a majestic, unimpeded view across Island Bay, a coastal suburb just south of Wellington—and Simpson sketched out plans for a 538-square-foot house that would accommodate a more experimental way of living. Seen from the outside, Simpson and Peebles’s house is unassuming, its inexpensive corrugated-metal cladding echoing the tin shed, a vernacular style of the region. “It’s a box, basically,” Simpson says. Much of the structure’s true beauty lies behind its unremarkable outer skin. As do most Masuzawa houses, the couple’s home contains a double-height space that was left undivided to allow the interior areas to connect and “borrow” space from one an-other. For example, Simpson says, the mezzanine bedroom in their house would feel cramped if it were fully enclosed, but opening it to the living area below makes it seem much larger. The same goes for the kitchen and the study, where the architect now runs his independent practice, WireDog Architecture. Two-thirds of the west-facing wall comprises huge floor-to-ceiling glass doors that slide completely away, opening the house to that stunning view. The door bottoms are lower than the threshold, so the joinery frame is hidden when the doors are closed. Elevated among the trees, the house gives the sense of being perched in the leafy canopy. Oriented to capture the afternoon sun in winter, the glass wall allows for maximum heat gain. This, combined with the tight envelope of the building’s insulated, five-and-a-half-inch-thick walls (the local standard is three and a half inches), means that the living space doesn’t need heating in winter—an impressive feat for a house on a coastal hill, where the weather is often blustery and cold. After the initial construction phase, the couple moved into the empty shell of the house and spent their weekends using a circular saw to craft the internal joinery, space-saving shelving, and a bookcase that doubles as the mezzanine balustrade. Materials like Italian poplar and Lawson cypress work together to give the space a warm, inviting feel. Simpson’s favorite element, however, is the white ash on the floors and ceilings, which was oiled once in place. The ash was torrefied, a process in which wood is left in a kiln until it begins to caramelize, giving it a rich chocolate tone. Much of the relatively tiny budget of under $150,000 was devoted to a few luxurious internal materials and fittings, with the limited scale of the house putting this small number of pricey items within the homeowners’ reach. In a country where low population density has encouraged architect-designed homes to become increasingly expansive and unaffordable, Simpson’s house is a bold statement—and potentially a challenge to the status quo.